ANDREA PEIPE - This was 2015! it has become a bit quiet on my blog in the past year but life just seemed to pass by so quickly this year and even though I planned to post something several times, I never did in the end. So it is the last day of 2015 and here I am with my review of the past year. 2015 was a year of changes. It was good year but also full of worry, changes, wonderful moments, love and turbulent times. I met lots of wonderful new people and had some personal changes towards the end of the year. I am VERY excited for 2016 and cannot wait for the new year to start! "The fluorescent light of day"
In February I met my friend Anne from Anne Puhlmann Photography for a quick shooting but it was too cold to stay outside for long and we decided to rather have hot chocolate! "One day we will be stars"
February was also the start of my project "The Dreamers" which shows people in nature carrying around their dreams in water-filled balloons in which a water creature swims which connects somehow to them. Almost everything you see in the photo is real (except for the fish or other water creatures because that would be cruel) and I always talk to the model about which water creature they have a connection with. The model for my first photo "Dreams of a better life" was my former intern and good friend Andrés Sichel who you might remember from last year. "Dreams of a better life"
In March, I had another shooting with Andrés - something I had wanted to do for a long time already! He put make-up on himself and turned himself into a very cool skeleton! I was so impressed at his skills! The rest of the month was spent with editing photos from shootings I had before. A whole bunch of us (photographers as well as models) met in Stuttgart for a few hours of shooting and fun together! I got to meet lots of new people but also see some people again who I love dearly! It was a great day with lots of wonderful photos as a result! A bunch of our group! At the meetup in Stuttgart I also met the wonderful and sweet Ponny from Seelenkind for the first time and we had another shooting still in April then. She is a really kind soul and great model and I am very sad that she moved to Hamburg in autumn. During the shooting, I took my second photo in my tree series and also my second photo for my project "The Dreamers"! In April, I was furthermore contacted that my photo "The fluorescent light of day" had won one of the precious "Gold Medals of Excellence" at the world famous photo art contest Trierenberg Super Circuit! I was beyond excited to be one of the winners! The end of April and beginning of May was also the time for the well-known Urban Art Fair STROKE where I was exhibiting together with my artist colleagues Brigitte Yoshiko Pruchnow and Michaela Wühr. The fair was 5 days long and extremely busy! Thousands of people visited, talked to us and bought postcards and prints. It was super fun (and super stressful) and I had the best time! I was also lovingly supported by my boyfriend and my friends Lisa from LMK and her boyfriend Marius! While preparing for the STROKE 2015, I was contacted by the Süddeutsche Zeitung as one of a few artists exhibiting and asked to create a photo for them just for that occasion. It was very last minute and I found a model who was kind enough to model for me the next day. Alina was great but I wish there had been less sun on that day because I prefer to shoot on a cloudy day. Still, I am happy with the photos. "Searching for what is lost"
While Lisa was still here, I also asked her to model for me using my new prism! "I only dream of you"
Two weeks after the STROKE Art Fair took place, I exhibited at another art fair - the ARTMUC 2015. It was also for a few days and lots of visitors came by, sometimes recognising me from the STROKE a couple of weeks before. The rest of the month I spent with my boyfriend in Portugal where we had the best time! A well deserved break was much needed after the stress of two busy art fairs! June came and so did Lisa from LMK! She only managed to be here for 22 hours in total but we took so many great photos in that short time! I am so grateful for her as a friend and model! We spent the first day in a park area outside of Munich and the second day at and in Starnberg lake. In July I met up with Lindsey for a shooting. I had asked her during the STROKE (where she was a visitor) if she would like to model for me some time and she said yes. Later in July I went to Saxony for the big meetup of photographers and models! I met so many wonderful people there and found lots of new great models! We spent four days there in a house at the beginning of a national park and I just had the best time! Among the people there were the photographers and models Mondmädchen, Esprit Confus, Elisabeth Mochner, Imaginarie, Mathilda Renoir, Greatbigwhale, Kettenkarussell, Ronja Malou, Paula Ohmann, Sturmideenkind, Atemlos Träumen, Marilla Muriel, Vulpeculhar, Seelenkind and several more! I took lots of different photos there - several nudes among other things - and really liked finding a new field in photography which I enjoyed a lot! I still have so many photos from that meetup to edit which I will post in 2016 then. "I hunger for your touch"
"The stars in your eyes"
In August, I went to visit my friend Moritz from Moritz Aust Photography. I spent a few days there and Lisa from LMK also came by most of the time. We took photos together, experimented and took a day trip to Bamberg together. Since it was a very hot week, it was difficult to take photos during the day and I battled with the sun. I still have a few photos from that time to edit as well. Later in August Seelenkind and me organised a meetup in Munich to which lots of models and photographers came. Among them were Michael Färber Photography, Korbinian Vogt, Cate Red, Michelle September Photography, Lisa Anselm, Sandra Singh, Spiegellicht, Mimik Photography, Joann Janin. We spent the day shooting in different locations around town and then had a wonderful BBQ by the river organised by Seelenkind and her boyfriend. It was such a lovely day with so many great friends and new people! Again, I still have got a ton of photos from that day!! In September several exhibitions took place - the yearly art exhibition in Bad Wörishofen where I already exhibited last year, the Art Week in Bad Wörishofen and the exhibition Pygmalion which took place in the APR rooms in a great location in Munich. I also had a very cool shooting with the very talented Jasmin Quan. We spent a few hours together in Munich and decided to shoot again and more elaborate some time but have not found time so far to repeat it. October came and with it the Gala Night of the Trierenberg Supercircuit! It took place in Linz, Austria and I went there with my boyfriend to collect my Gold Medal of Excellence! It was a fantastic night, much cooler than I could have imagined! Before the show, I had to fetch my medal and then I had to go on stage to answer a question about my art in front of all these people. There were so many great photos which they showed during the show on stage and all the winners had to go on stage. There were photographers from all over the world - from South Africa, Australia, Italy, China... it was a really great night! After the show there was a wonderful buffet and you had a chance to talk to the other photographers. One of our table neighbours and winners of the same medal as mine was the lovely Bella von Einsiedel who was there with her partner Anja. Together, they are BellAnjaPhotography. We got on so well and it was such a pleasure to get to know them! In addition to the gala night, here was also a huge exhibition of some of the winning photos and other photos chosen by the jury - 3 of my photos was exhibited which made me very happy! I also had a really great shooting with Daniel Riedl and Cate Red in that month. Daniel asked me to take photos of a model wearing a wig he had made. We discussed what we could do and where and I suggested Cate as a model. It was a really great experience to work together with those two! The first setup was his idea and the second one mine. My former intern and friend Andrés Sichel also came back to Munich for a short time and even though we unfortunately didn't see each other often, we had one shooting together where he assisted me and did the hair and make-up of the model. It was a really fun shooting with him and my awesome model Lena who drove for a few hours to model for me that day! I have not edited all photos from that day yet but love the ones I posted so far! At the end of the month, I exhibited at another art fair - the STROKE Ltd. in Munich! I shared a wall with my artist colleagues Brigitte Yoshiko Pruchnow and Michaela Wühr again but this time we also shared our concept. We created three group pieces which had a topic and color scheme each. One of us was alsways the creator of the middle piece and then the other two artists had to come up with fitting side pieces to complement the middle piece. I had my images printed on wood for the first time and the reaction was VERY positive! People loved it, esp. with the square one. My images are the first middle, second left and third right by the way. Our booth at STROKE Ltd. Most of November was spent in South Africa with my boyfriend and his family. Family time was much needed and most enjoyed. And something really wonderful happened as well while we were there - we got engaged!! We will get married in 2016 - not quite sure if in Germany or in South Africa or both yet! In December I was super happy to have the spontaneous opportunity to meet Rob Woodcox who was in Munich for 2 days! Laura Zalenga organised it and there were 8 of us who met up to hang out, explore Munich and its Christmas markets, check out Nymphenburg castle and have burgers. It was such a fun time! "Your heartbeat matches my own"
A few days later I left Munich for a meetup of meetup fun in Leipzig! I spent the night on the way at my photographer friend Lia from Liancary and then early the next morning we continued to Leipzig together. 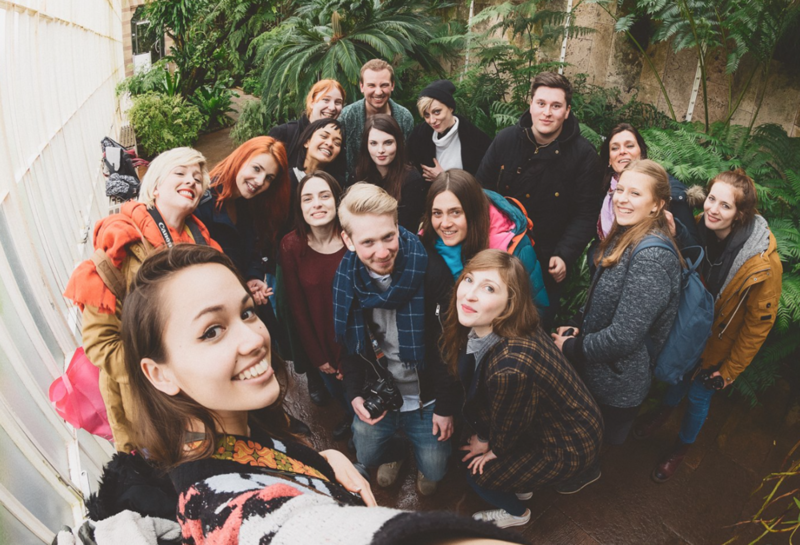 Our group took photos in Leipzig on Saturday and then in a studio on Sunday. I have not managed to edit more than the one photo from that meetup but I have a few left still. It was so great to see Esprit Confus, Mondmädchen, Jott, Vulpeculahr, Paula Ohmann, Mathilda Renoir, Hanna K. and Andreas again and get to meet Nora Scholz Photography, Victor Hamke, Martin Neuhof, Marwin, Lara Anouk and several others! "Your skin smells like the sea"
So, this was my 2015. How was yours like? What did you create or experience? Let me know, I would love to hear from you!